Got it on the street in the 3rd week of august ('98) and I've driven it to VW Euro and the London-2-Brighton run as well as all kind of local trips. I think i've clocked up about 3000km sofar. The previous owner put the bus in storage without putting any fuel in the tank. This resulted in rust in the fuel tank. Once we started to drive some real KMs, the rust started to came lose and ended up blocking the exit of the tank. Draining the tank works for a while. Hans came over on wednesday. The locked up front brakes where easily fixed with some new flex hoses. (1302 hoses work on a baywindow bus). Final job for the day was welding in a new lower sill (Hans had brought his welder). The previous owner has been a verry big fan of undercoating, so the welding did not go so good :-( First we had to remove all the black crap with the angle grinder. Could testdrive at 21:30. Had been over a year that i had driven the bus, man it felt good!! He had to readjust the rear brakes (left was set stronger that right), was cool to be able to walk under the bus so i helped him a bit. "time for coffee" sais the mechanic. SO i join him and the other guys that work there in the canteen in the top of the garage, i could look on the roof of the bus. As we sit there the guys start to mesmorise about the baywindow they used to have as a company car. "Didn't they used to have a stabiliser bar ?" ask the mechanic. OOPS ! Finally he mechanic sais "it's ok except for the front tires, but i don't have them in stock. Come back tomorrow for the tires and well put a stamp on it". YES !!!!! Replacing the balljoints was also an item on the agenda. We didn't want to take the trailingarms of the bus, so we figured out a way to replace them with the arms still attached to the car. First you use an anglegrinder to weaken to top of the old joint (dont damege the �rm the is pressed around it). Them your hammer on the bottom of the joint until the rod and ball unit comes out via the top of the bushing that is still pressed into the arm. 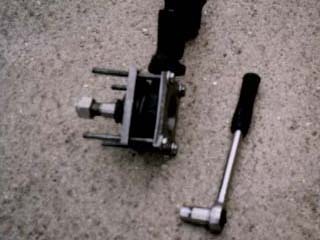 Use a hacksaw to weaken the bushing and hammer it out.